Rated 5 out of 5 by msmyself from Enchanting indeed! I don't write many reviews but decided this one was worth a few words. Pros for me: *I really loved the storyline, including all of the different scenes and characters - dragons, fairies, talking cat people (felizes), goblins, etc. *Very eye-pleasing crisp, colorful graphics and animation. Soft, soothing music. *Long gameplay - worth the money for a CE. *Many potions to make throughout the game including the bonus chapter Cons for me: *Alot of Memos (pieces of writing) to find...became a bit tedious after a while. Great game overall....keep more like this coming!! Rated 5 out of 5 by julialynn from Family Friendly I was so happy and relieved to have this game. Me and my 7 year old daughter played it and we loved it. For the first time, we could do the mini games as they are always too hard for us. No blood, no guts, no disgusting scary things here. Just love and great cute graphics. Very happy with the fairtytale happy ending too. Highly recommend. Rated 5 out of 5 by Gyongy from Lovely game Another imaginative, well executed game that was the pleasure to play from start to finish. The graphics were so lovely and imaginative and the story line fun to follow. I highly recommend this game. Rated 5 out of 5 by leagueSK from Best EVER!!!!! Keep in mind, I don't actually like HO scenes, where you have to go rifling through things you don't need, so this game was perfect for me. The storyline was your usual romantic storyline where you have to go rescue your loved one from the evil villain, but was original enough that it didn't seem like you were replaying a different game all over again. I played on the casual difficulty, and found it perfectly balanced with a bit of challenge to keep me interested but not too much to have me beating my head the desk. The game lasted me a good few hours (don't ask how many, I wasn't keeping count# and the bonus chapter was at least two hours for me. The bonus chapter was set from BEFORE the actual game, so those who buy the Standard version won't miss anything by not getting the CE. The dragon #your hint# was adorable and cute, and was very helpful. If the hint told you to change location, the ring of light remained for a few more actions - showing you if you needed to keep going, or pick something up in the new location, which I found extremely helpful. The SG was a bit hard to find at first, but it is actually sitting right under your nose - its the compass above your dragon. Graphics were utterly magical, though cutscenes could be slightly pixelated #blurred) - but it didn't seem to be the case for all of them. Sound FX were good, and your dragons makes cute sighing noises when he's charged. All in all, about the best game I've played in ages. Rated 5 out of 5 by Amijane from A great NO HOS game! There is in fact some games here that is very similar to hidden object games whitout the HOS but with the minigames, unfortunatly they are all rather scary and I so so like them. 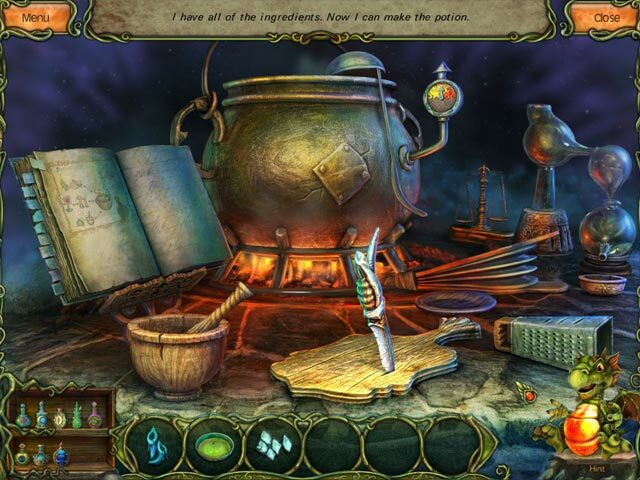 This is the first really great NO hidden object scenes game that I have liked. good minigames, great graphics & sound and a lot of potion brewing (if you don't like cooking games perhaps you won't like that part but you can skip it). Altogether a fantastic storyline about a human (well, at least mainly so) girl and her Felize fiancé (means he's a werecat). For fantasy lovers this is a great game if you want more of a an interactive book than a challenging game! Rated 5 out of 5 by MEnr56 from BONUS PLAY NOT QUITE AS REVEALING AS IT COULD'VE BEEN I have to say that I THOROUGHLY enjoyed this game and the storyline is VERY BELIEVABLE; however, the bonus play stopped short of revealing exactly what happened to the werecat carrying the baby. An early note in the beginning of the game explains how the baby was found but also appears to infer that it was not the same hunter who mortally wounded the werecat; so it begs the question -- so how did the werecat become mortally wounded? The game play was easy to follow due to several factors: *the map is interactive and not only informs you as to where you can perform tasks but you can jump to said area(s) *as long as you read the notes and the messages above the areas wherein you need to perform future tasks, you'll pretty much instantly know what to do with a newly acquired inventory item *you DON'T have to hold onto any inventory item for what seems like an eternity before using it/them allowing the possibility of forgetting where to use it/them *each inventory item is labelled but BE CAREFUL as I've noticed a few times that I ALREADY had an item in my inventory and didn't know when nor how it ended up in my inventory so check it frequently *the dragon hint works very well and recharges quickly BUT you can recharge him faster if you feed him the glowing yellow balls that are floating about in certain areas AND you can return to an area where you saw the glowing ball WHILE you're also following his directions as to where to go and do next AND he'll also highlight the inventory item you need to use; there were a couple of areas that the map didn't clarify the EXACT area wherein a task needed to be done *the potions are EXTREMELY easy to find (don't even need to worry about what to look for) and to make as once the pot is filled with the necessary items, the pot will activate and as long as you follow the WRITTEN instructions (NOT the diagram), you won't have any problems. HOWEVER I did find myself stumped with the 1st arrow as to how to cut an item (start from the other end of the arrow) because it did NOT want to allow me to do the cutting; FORTUNATELY, there is a "skip this step" at the top of the screen and so I did and from that point on, I never had the problem again. Rated 5 out of 5 by jcsgame from Lovely and Romantic Game I thoroughly enjoyed playing this game. The graphics were clear and colorful. The story was a romantic tale of two lovers from different backgrounds (one magical and one human). This was a nice adventure of rescue and learning the truth about where she came from and what she is meant to be. There aren't any collectibles in the game, but I didn't miss them at all. It allowed me to concentrate and enjoy the game more. Rated 5 out of 5 by Angelique1971 from cute and entertaining I enjoyed this game. The graphics produce a busy and beautiful environment. You are transported to a wondrous world, delve into a desparate search for your love and meet magical creatures along the way. The 70 memos you are to find give you a deeper understanding of the story and gameplay. Some may not appreciate the amount of reading. This is predominately an adventure game with some simple and fun puzzles thrown in. (The absence of HOS is a bonus for me.) I played on Expert and still it is not difficult. Mixing potions is an added pleasure. There is a travel map that shows active tasks, unless you choose to shut it off. Unfortunately, there are no achievements in this CE but it has a great, pre-main game Bonus Chapter. I found this game to be cute and entertaining. Rated 5 out of 5 by BirdLover89 from Delightful I enjoyed this delightful little game. The scenery, story and everything were really good. I loved the little dragon Hint; he was so cute. The other little critters were cute also. I still have the bonus part to play and am looking forward to it. Recommend this game highly. Rated 5 out of 5 by ladywilmeth from Wonderful Game I really enjoyed this game.Not to hard,not to easy. I thought it was fun and interesting. I recommend his game. Rated 5 out of 5 by babe09 from Wonderful Game! I found this game a little sluggish and over texted at the beginning, but as I got further into the story line, the more intriguing it became. Stick with it and I am sure most of you will enjoy it as well as I did. I rarely review, but some of the negative things that people found as they were rating it prompted me to invite you to please try this game. The graphics were very well done, and the colors and images were excellent. I loved the characters in this game and found myself tossed back into my childhood, recalling all the mystical faery tales that I grew up on. If your a romantic in that respect, I think you will find this game appealing. The only downfall to this game, was the over abundant text, and the way it ended. I have a feeling it was left to include a follow up game one day... I recommend this game for the young at heart, the romantic and those who want something that is just a little less dark than most games on here. Rated 5 out of 5 by michelle1187 from Fun and Entertaining! I think this is the first time I've played a game thinking it was gonna be a story/HO Game and it wasn't. But, I was not disappointed! I enjoyed the story and all the different puzzles. Very enjoyable game. Well Done. Rated 5 out of 5 by Saunnylu from What a Delight! After so many supernatural/evil/dark forces games offered by BFG, this game Forest Legends is just a delightful change of pace. It's mesmerizing partly because of the baby dragon, and partly due to the game design and storyline. Graphics are beautiful and no problem with resolution or DPI. Had to force myself to break away. Looking forward to game sequels! Rated 5 out of 5 by IvanRic from A great adventure game! (based on demo) I was a little shocked at some of the negative reviews about this game. You can tell a lot of time and effort was put into this game. The graphics are great and lush, there are many interactions throughout the game. This is definitely a buy for fans of the genre. The story is a tad on the cheesy side, but honestly, so are most. I am glad I tried this game and will buy the full version without a second thought. Rated 5 out of 5 by Wolfpupscvc from WOW!!!! What a Game to Play This game was great to play. The storyline & Music was very good. In this game you get the Baby Dragon for your Hints. You are going to like this cause of this storyline between two lovers as one is Human & the other is a Werecat. Eveline has to go & save her lover as he went hiding in the Forbidden Forest from her father as he is captured & her father wants him killed. I am not going to say anymore about this story, as you need to buy this game to see for yourself how good it is. Enjoy!! Rated 5 out of 5 by lrmc112060 from Extremely Entertaining Pure Adventure Game I've been playing games for a very long time and I know what I like. This game stands out for me because I really had fun playing it. I found it very entertaining, the story was very good. I REALLY LIKED THE FACT THAT THERE WERE NO HIDDEN OBJECT SCENES! I am so tired of those. I'm also tired of dark and creepy games (there are so many). I like fairy tale themed games with pretty houses, cute and interesting mythical creatures, and sunny forest glade like scenes with plenty to do. This game has it all. I sure wish there were more pure adventure games like this. The story has some depth and the graphics were bright and beautiful. There were plenty of interesting characters and the game was pretty long. I didn't want it to end! I found some of the puzzles unique and fun. I enjoyed making the potions and reading about the story along the way. I hardly ever write reviews but I was compelled to write this one because this game merits 5 stars in my opinion! It is highly imaginative and I can't see any faults to it at all unless some people don't like the fact that there are no hidden object scenes. Come on, aren't we tired of those anyway? They get in the way of the story for me. The bonus chapter was a good length too and added to the story line. I bought this game and I would recommend it to pure adventure lovers like me. Rated 5 out of 5 by traquet100 from Best Game in a while 5 stars to the developers!!! This was great. 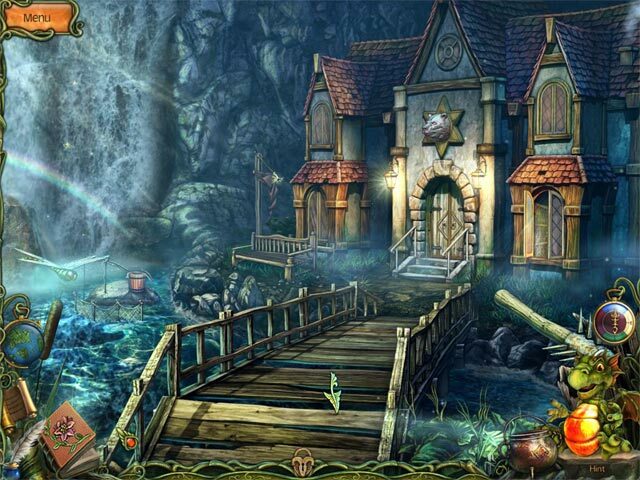 not your typical hidden object game so I didnt get bored with it halfway thru like the others!!! More like this one please!!! Rated 5 out of 5 by marciabb from Excellent game! This game is breathtakingly beautiful! Every new scene is a gem.. That's for me enough reason to wait for my second game credit and purchase. Rated 5 out of 5 by Keridwen from Very Good Game!!!! Excellent graphics and game play. I had fun!!!! Rated 5 out of 5 by cindybuns from Ah Romance----Different Kind of Game (demo only) I tested the Beta and from what I remember of it there were some HO scenes, but when I tried the demo today, it looks as if it were completely revamped so far in the demo no HOs. They've created a new world and a new species werecats; star-crossed lovers; misguided humans; and a cute dragon helper (hint# which you can recharge along the way with fireballs. There are cutscenes where the lips do not move but that is not too annoying; for the hero his voice could have been better #should be stronger sounding#; the others are ok. Otherwise 1--great graphics; not dark but colorful 2--new world created, with different looking creatures 3--2 modes of play 4--hint dragon which you can feed 5--transporter map #beam me up Scotty# 6--diary which you can read or hear the heroine's voice; includes task list 7--make your own potions This game has a different feel to it which some may not like; but if you are in the mood for romance then this is a buy #especially with the sale this weekend!). Since I tried the demo I have been waiting for this game and even though they have revamped it quite a bit I will purchase this game. I find these types of games are few and far between and are a welcome relief from the dark games they usually put out; so when one appears and on a sale weekend I strongly suggest if you are tired of the dark side go for the light; or at least give the demo a try! Rated 5 out of 5 by MSBAM100 from Re-unite Eveline with her love (who happens to be a Werecat) This is a great new scenario from one of our great developers. It takes a while to build (a bit of talking), but once you get going, there are surprises galore. You are Eveline, adopted daughter of the famous hunter Francis, who is engaged to Aurelio, a Werecat (also known as a Felize). Of course the humans hate them, and her father tries to kill him. So he runs to the Forbidden Forest, which is beautifully drawn and every scene is wondrous. You have to find the healer and make a potion to save him. You get a baby dragon who functions as your hint button, who recharges quickly (and can eat magic balls to make him recharge immediately!) The map is interactive and shows open tasks, which can all be hidden. The mini-puzzles are very unique and interesting. No HOS in the demo. You find 10 memos which help explain the story. Didn't need the strategy guide. Of course there is also a bonus chapter. The forest is beautiful, and sets the mood of the story and makes it not creepy but enchanting. The healer gives you a recipe book and to make the first (of many# potions, you gather some items, then prepare and cook them as if you were in one of the cooking games that make you chop by following an arrow with your cursor, and stir by following a circle -- a nice, different touch. I am hooked and will buy today #with the discount even!). Rated 5 out of 5 by SassieBear from I want a baby dragon! This truly is a magical adventure game. 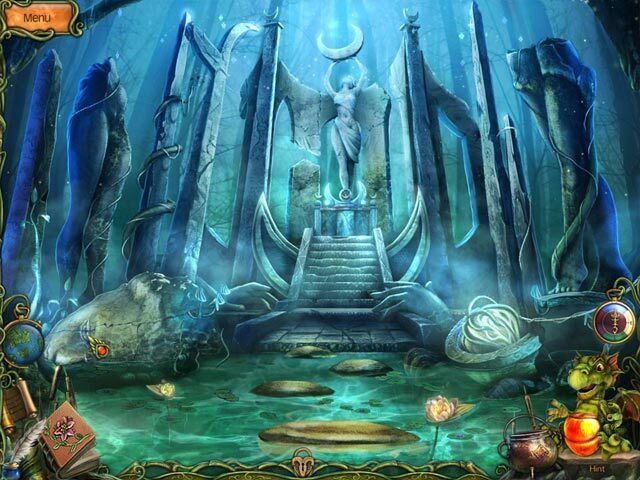 Beautiful graphics rich with color and imagination just as a magical world should be. Your little helper is the cutest of cutest baby dragons. Although the characters mouths do not move durring coversations, they are physically expressive using body movements whilst they do speak. This does not detract from the game in any way. The puzzles are excellent, some more difficult than others with the skip option still available in the hardest mode of play if needed. Good solid and interesting story, great graphics, music and voice overs. Loveble characters, and of course a dragon of your own. I can really immerse myself in this game, and I hope you can too. Rated 5 out of 5 by kanziggirl813 from Forest Legends Just bought it. I really like it!! 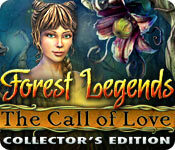 Rated 5 out of 5 by pam72149cunningh from Forest Legends: The Call of Love An excellent puzzle adventure game, without any HOS. Very nice change of pace. My hour was up too quickly. Rated 5 out of 5 by Tufty57 from Refreshingly different in many ways What a pleasant surprise. When I began the demo, I checked out the extras (Music/Wallpaper/Concept Art/Bonus Chapter) and prepared myself for disappointment. * No collectibles nor achievements, which I love in a CE. * Only two levels of challenge (Regular and Expert) When I began to play, there were so many conversations and voice overs with rather unconvincing voices. (Strange eastern european accent for the werecat and a very youthful voice for the mature father character) No lip sinc which some will find annoying HOWEVER, when the game finally got going, it was really quite refreshing. There are: * 70 memos to collect in your journal * An interactive map showing location and tasks * A fiery little helper who also acts as a hint * Lots of new and interesting puzzles (which I skipped in the interest of getting as far as I could). Most are really quite challenging and thought provoking. * NOT ONE HOS! Plenty of pickups but no lists or junkpiles The storyline began to engage me as, although it is another 'rescue fiance' story, it is very different. As well as the rescue story, there is the mystery of our heroine's origins. With the lack of achievements/collectibles, I would normally wait for the SE but, this one has caught me hook, line and sinker. I will just have to buy it and this time I will master those tricky puzzles. Do try the demo and STICK WITH IT for the FULL hour, you will be glad you did!